The Web Content Accessibility Guidelines, better known as WCAG, are a series of web accessibility guidelines created by the Web Accessibility Initiative, a branch of the World Wide Web Consortium (W3C). WCAG is geared towards serving those with disabilities, but also provide guidance on creating websites that are accessible for ALL users by laying out some essential best practices. WCAG began as the Unified Web Site Accessibility Guidelines in 1998, but has evolved several times over the intervening decades. The latest guidelines for WCAG were adapted in April of 2018, so they reflect most the most recent web technologies and current accessibility issues. While it may seem like WCAG is simply a list of “best practices,” most of its principles are actually mandated by law as part of Section 508 of the Rehabilitation Act. In fact, as of January of 2017, all of the 38 A-level and AA-level criteria addressed by WCAG are part of Section 508. Any business or entity that does not follow these guidelines can be subject to lawsuits based on discrimination. For the full explanation of WCAG 2.1 guidelines, visit the W3C website here. There’s a lot of other information and supporting documents we won’t reproduce here. Instead, we’ll focus on the four main principles of WCAG 2.1. All information is taken directly from the WCAG documentation. In basic terms, this means all videos must have captions or transcripts and any visual content must be able to be accessed through assistive technology. This guidelines states that any website should be able to be used by anyone with a physical disability, for example, someone who is unable to use a mouse. This guideline is designed to help assist those with varying cognitive abilities, perception or processing issues, lower technical proficiency or those with language barriers. This guideline not only asks that websites are compatible with current technologies but that it is prepared for future iterations of these technologies. If you’ve read our previous post on universal design, you probably noticed a lot of similarities with WCAG 2.1 guidelines and the principles of universal design. That’s not accidental. 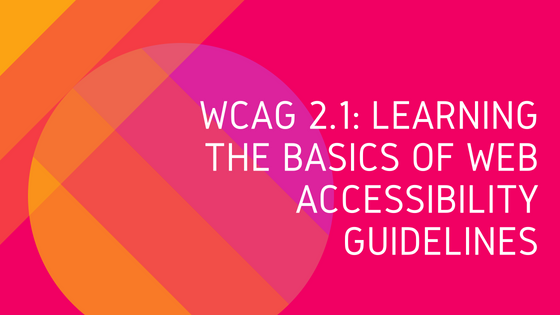 WCAG 2.1 guidelines aren’t just to improve accessibility for those with disabilities, but can help make websites more accessible to any user. In our next post, we’ll explain how to actually apply these guidelines to your courses and to ensure that you’re following them to the letter of the law.